Boasting of 7 Gorilla families available for a Rwanda Gorilla Safari Holiday to tourists; Rwanda offers enthralling Gorilla trekking tours. 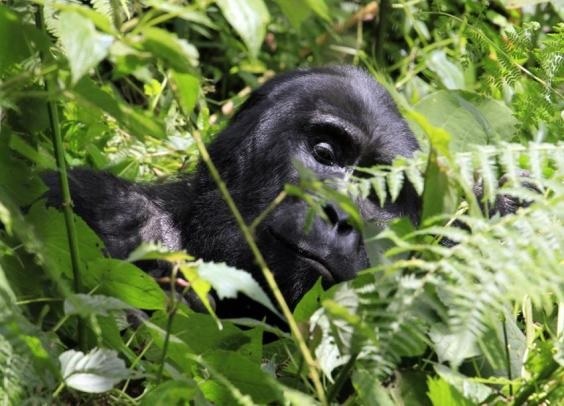 A trip to Rwanda would definitely be incomplete without a Gorilla Trekking Tour at Parc Nationale des Volcans (PNV) or Chimpanzee tracking expedition at Nyungwe Forest National Park. Rwanda is a land locked country located in Eastern Africa. The country is one of the only three countries where the critically endangered mountain gorillas still live to date. Gorillas are one of the most feared animals in the world, thanks to movies like King Kong and Congo. Mountain Gorillas are large, powerful creatures that are also gentle and affectionate which traits can easily be observed on a Rwanda Gorilla Safari Holiday. Contrary to the perception that Rwanda offers only Mountain Gorilla Tracking Safaris, travelers can also opt for a wildlife safari at the Akagera National Park that is now a home to all of Africa's big five. The reintroduction of Rhinos and African Lions in the Akagera National Park has ideally positioned the park as a perfect destination for an African Big Five Safari in Ruanda other attractions in the park include Elephants, Buffaloes, Zebras, Waterbucks, Giraffes, Antelopes, Elands and Leopards. Adyeri Creations strives to bring you a unique and memorable Rwanda Gorilla Safari experience through our expertise and commitment to ensuring each of our clients depart Rwanda with a wonderful experience. Nothing beats the exhilaration of tracking and then finding the normally shy Mountain Gorillas. Carefully controlled visitor numbers in the Volcanoes National Park and a dense number of primates this Safari offers the ultimate Wildlife excursions of Rwanda, traversing three National Parks. This amazing Gorilla Tour is inclusive of stop overs at some of Rwanda's cultural sites like the Kigali Memorial Center. One of the best preserved montane rainforests in Central Africa, Nyungwe Forest offers a wide diversity of animals and a natural habitat to over 13 primate species. The forest is in the Albertine Rift which forms part of the the western section of Africa’s Great Rift Valley and serves as Rwandas's primary water catchment area. This safari includes a brief stop over at Nyanza for a tour of the Rwanda King's palace.